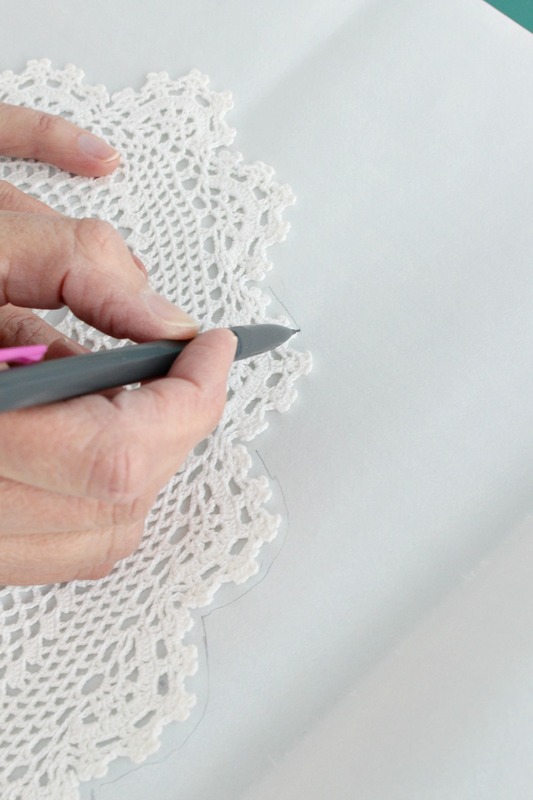 Do you have a pile of inherited doilies, with no idea what to do with them? 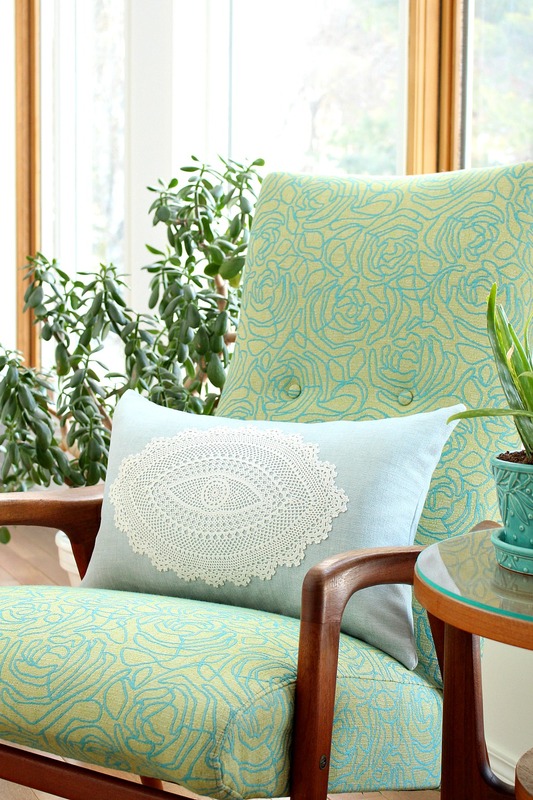 Even if doilies aren’t your jam, you might like this project: a modern, simple, DIY doily throw pillow. 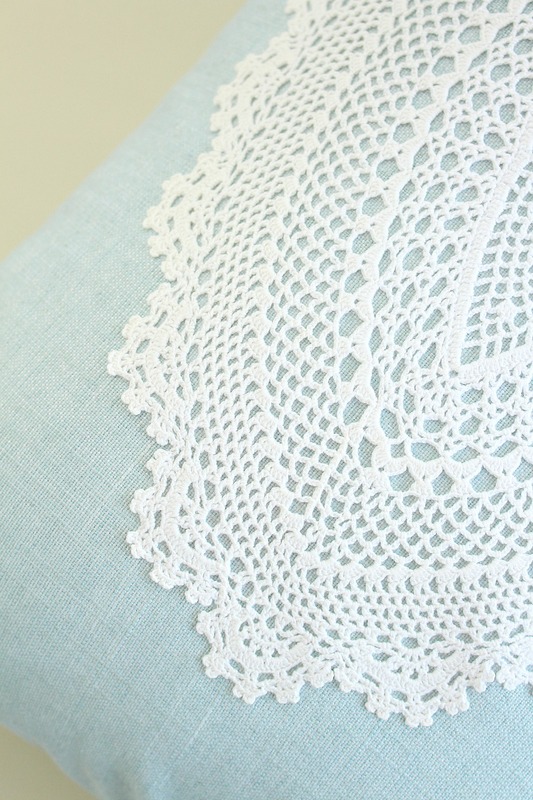 Between the pale aqua linen (yum) and the unusually cool doily – which I swear looks like an eye! 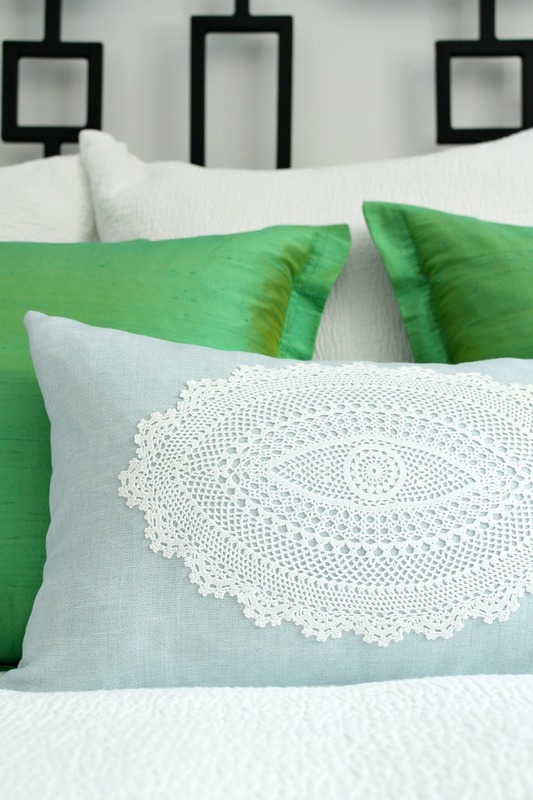 – this easy to make decorative pillow might have turned me into a doily covert! The idea for this doily project actually started germinating when I was rummaging around in my Mummu’s yard sale pile and discovered an entire box of vintage crocheted doilies. Even though I don’t love doilies, I couldn’t help but marvel at how intricate and delicate some of them were. 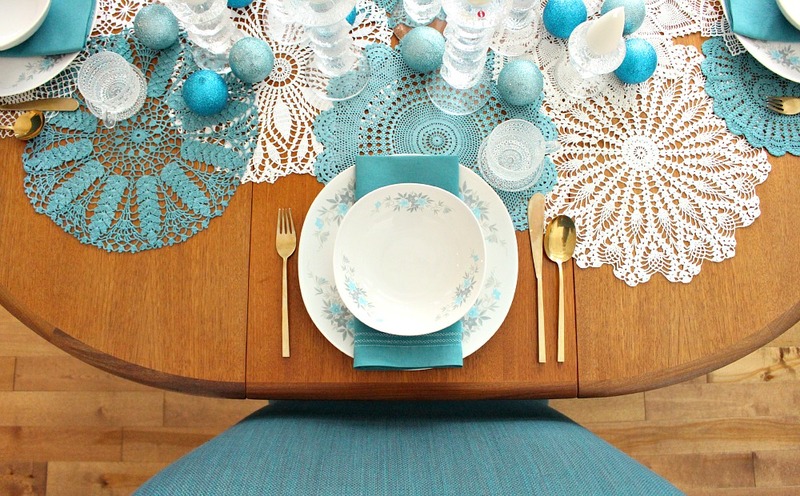 You might remember that I dyed some of these doilies different shades of teal for a wintry table runner? 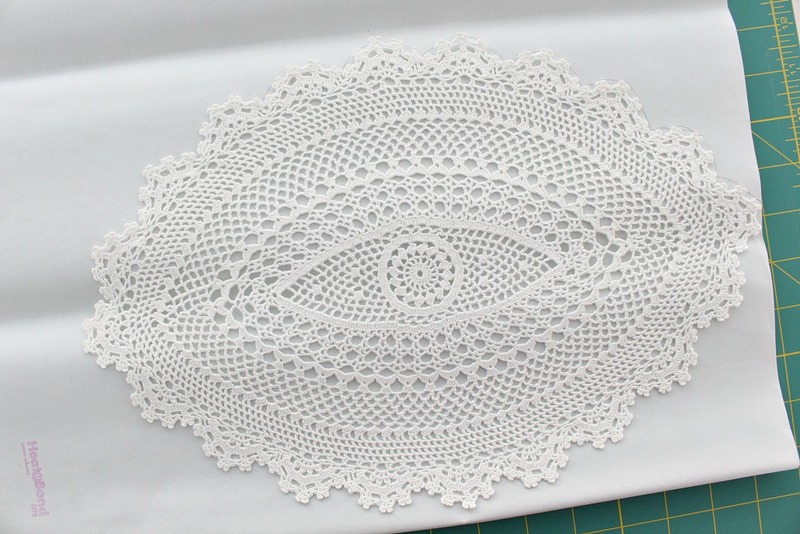 After I was done with that project, I couldn’t think of another use so I returned the box of doilies, but couldn’t stop thinking about this eye-shaped one – so I asked for it back. I had NO idea what to do with it, because I’m not really a doily person. I loved how my tablescape turned out, and I do have a sentimental Hungarian embroidery framed in the hallway, but other than those two anomalies, my aesthetic tends a little more to the mid-century/modern. I decided to hoard this doily anyway, and then magic happened. When I bought the white linen fabric for my DIY closet curtain, I also purchased the same linen fabric in an icy, pale, shimmery blue hue because I couldn’t resist. It was also on sale for $3/meter. $3 for LINEN – that’s ridiculous. I had thrown it on the dining room table and then happened to empty some other crafting supplies from a random bin of stuff to sort out and the eye doily tumbled out onto the blue linen. 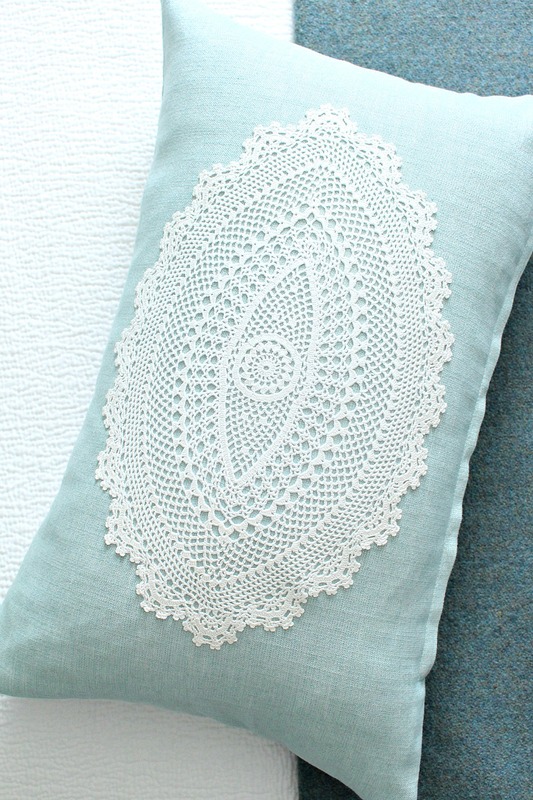 All of a sudden, seeing the doily on the pale linen, I realized that the combo would make a gorgeous throw pillow! 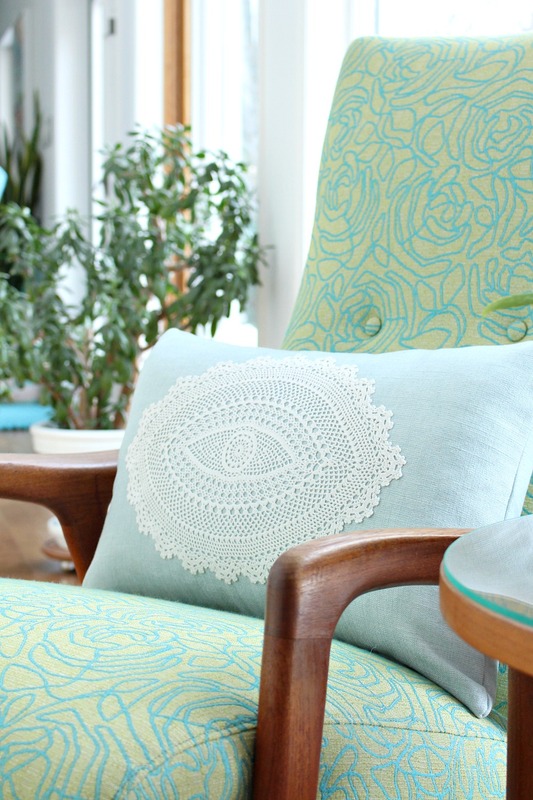 If you love the look too, here’s how to make a modern DIY doily pillow. 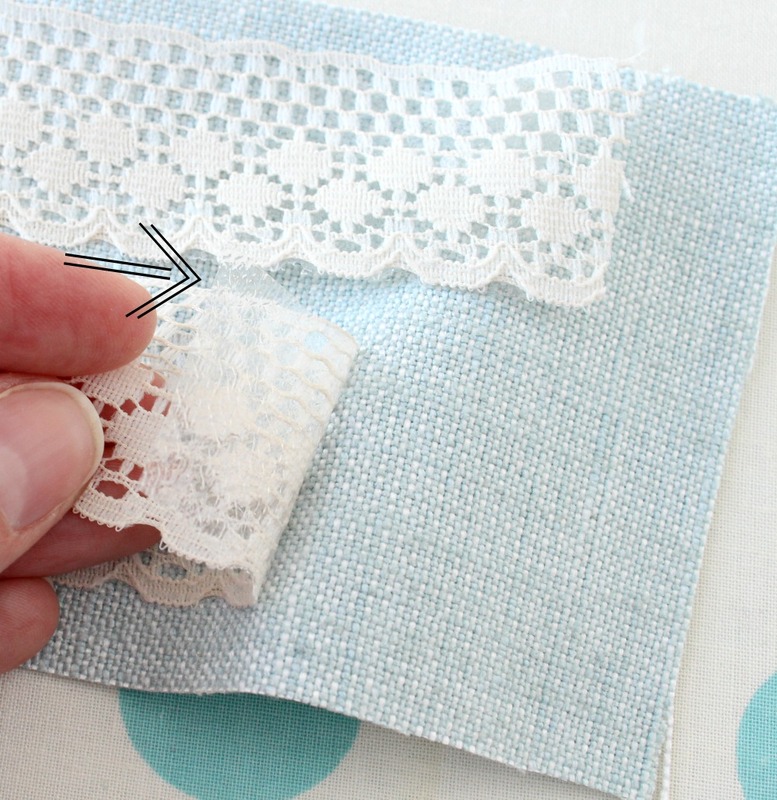 Read on for my tips and tricks for adhering the doily for a smooth look. 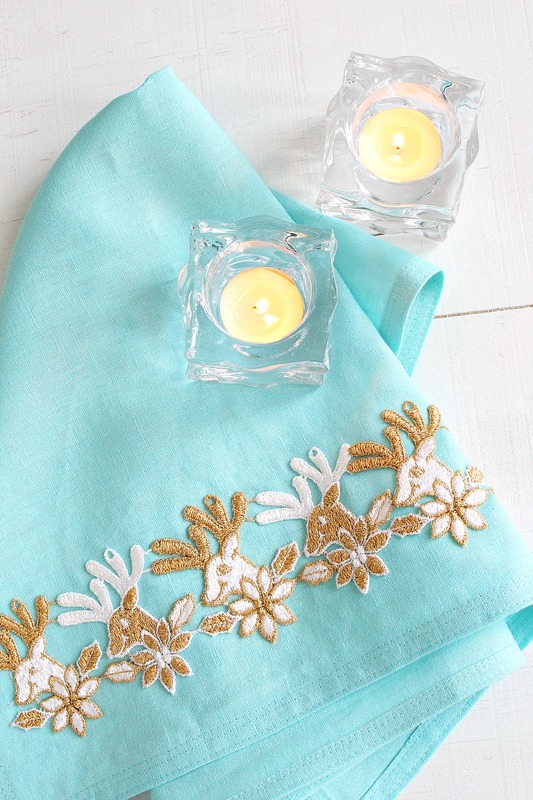 I thought about using the same fabric glue I used for my DIY linen tea towel with gold reindeer trim, but I dreaded the idea of dabbing glue on every inch of the finely crocheted doily. My Mom offered to try sewing it on, but we were both worried it would slide around and end up wonky or stretched out. Luckily, while rummaging around in the Fish Room, we found some Heat Bond iron-on adhesive (rewarded for hoarding again). 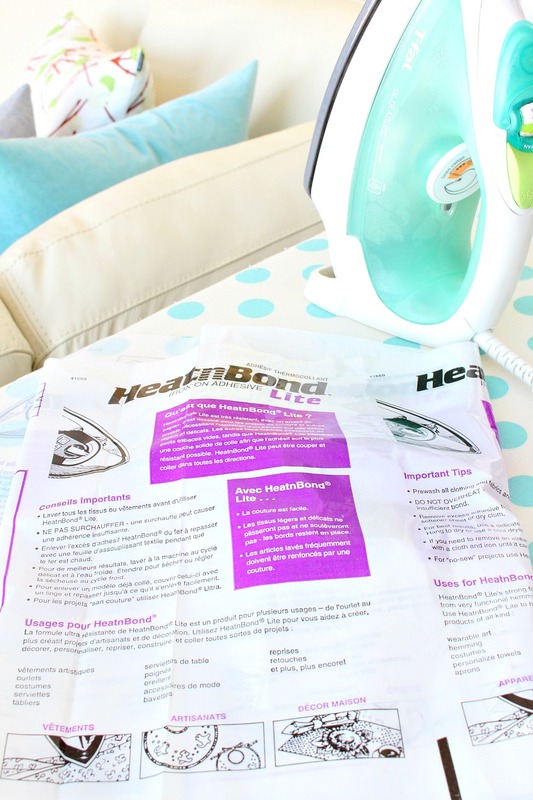 This is how heat bond iron-on adhesive works: you apply it (backing up) to the wrong side of whatever you want to adhere to another fabric. You gently iron (no steam), remove the backing, place the newly created applique onto the fabric (adhesive side down) and iron again. The adhesive bonds the two fabrics. It dries clear and the only sign is if you hold the pillow to the light, it’s a bit shinier where the adhesive is. It’s really, really not noticeable. Although this heat bond adhesive is strong enough to use alone, we were worried because we’ve had this stuff for a long time – would the glue weaken? 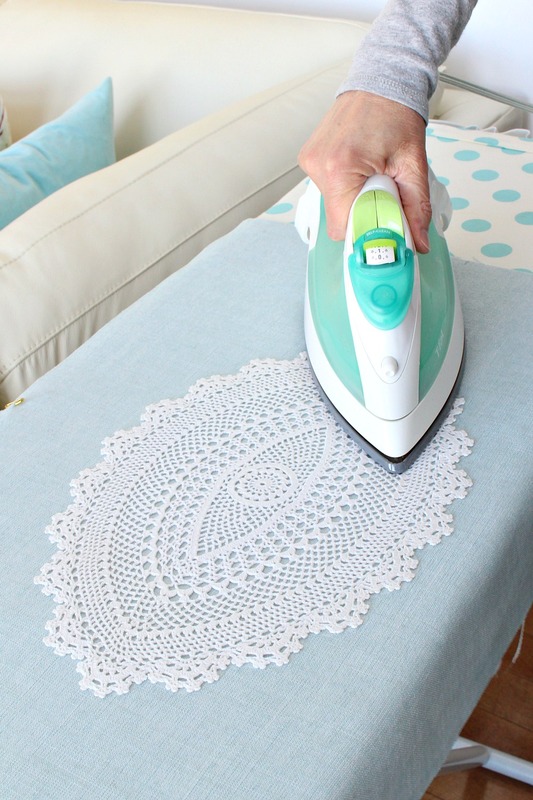 Just in case the bond relaxed over time, we decided to sew the doily down in a few inconspicuous places. 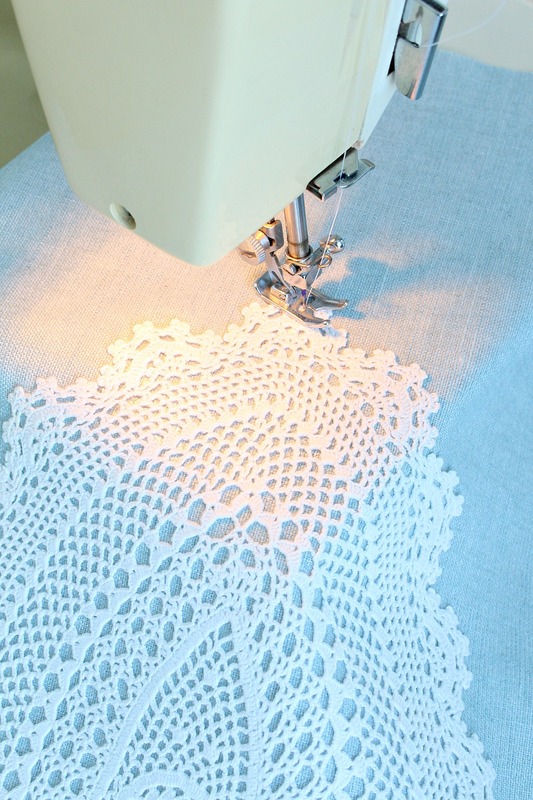 With the adhesive helping to keep it in place, we no longer had to worry about the doily sliding or bunching while we sewed, so we did a few loops around the doily, tracing the design in the middle and along the edge. 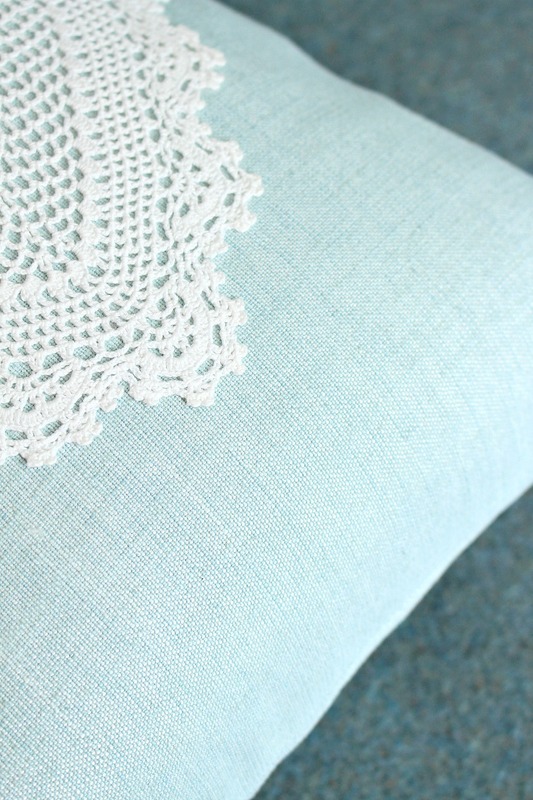 With the doily firmly adhered and sewn in place, we sewed the linen into a cute throw pillow with a flapped zipper. 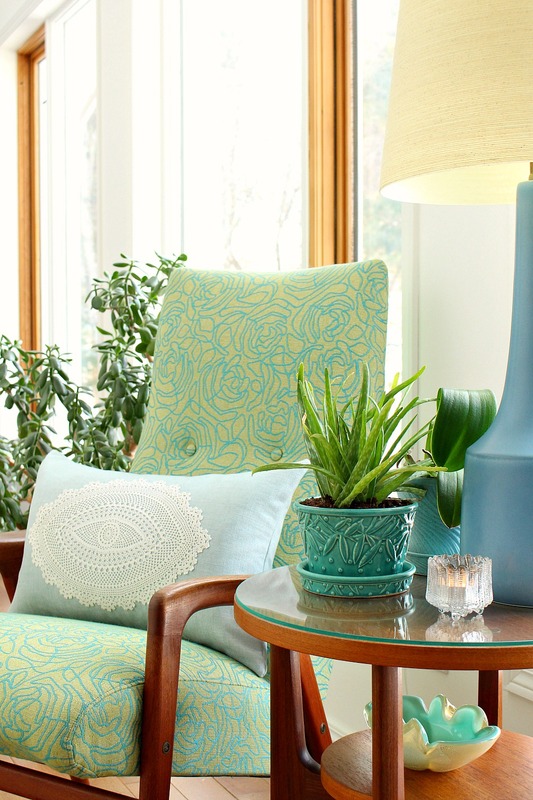 Check out our tutorial for how to sew a throw pillow with a zipper – there are tons of detailed photos and step-by-step instructions (click here if you missed that post). 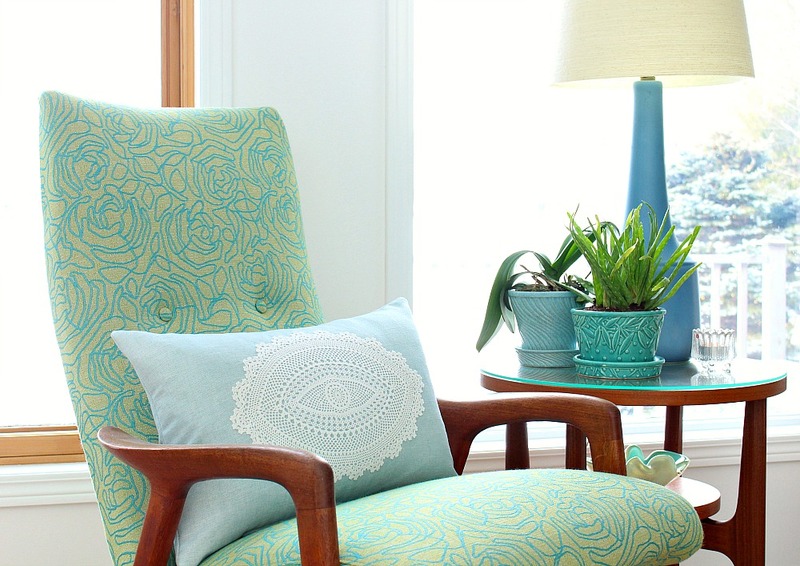 You could always just add a doily to a pre-made pillow, but you’d have to put all of your faith into the adhesive. 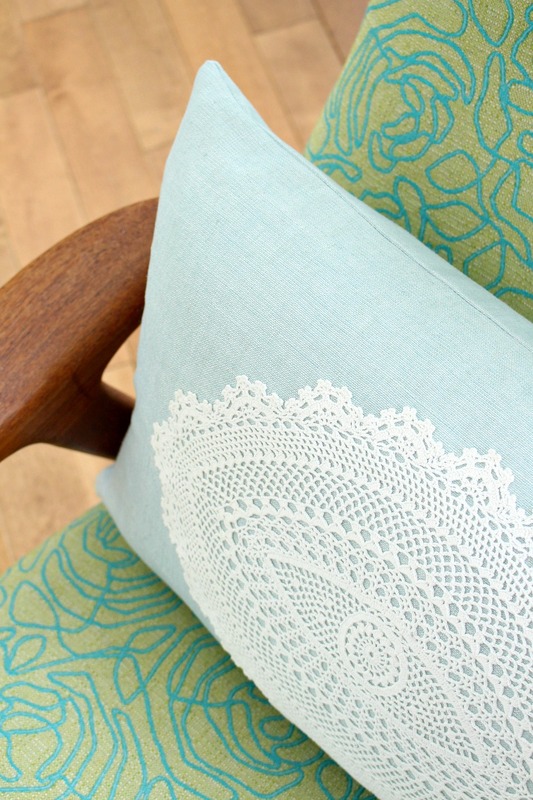 Here’s what the finished doily pillow looks like! love this- it totally looks like an eye! It looks very fresh and summery. But, I would add tassels to the corners to give it a more finished look. Very cute idea!!! 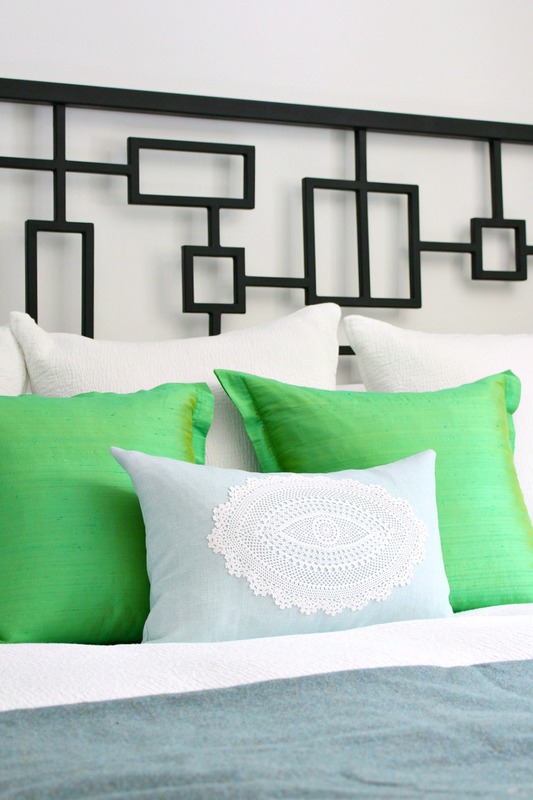 As much as I loved making tassel keychains, I’m don’t think a tassel-y pillow would suit my otherwise kinda modern decor, but if you make this pillow and add some tassels I’d love to see! Such a cute idea! It’s perfect for spring!